Exclusive $1000 bonus (10x the regular). Unusually soft competition at high stakes. Lots of functionality, including mini tables. Pretty good high stake traffic. Good variety of games, 5 Card Draw included. Low number of deposit options. GNUF is one of the newest of Prima Poker’s many poker sites with a name we cannot explain – does it mean anything at all? But let’s put this minor issue aside and look at the rest of the package, which does fairly good when compared to its competition. The software is based Microgaming, but we aren’t too happy about the theme of GNUF, nor the colors. Aside from the visuals, you have a proven software package with little or no bugs at all and plenty of functionality. When signing up with EveryPoker, you also get a 10x larger bonus than the original, and ultimately the access to a boatload of guaranteed tournaments, satellites to WSOP and WPT, 5 Card Draw gaming and very soft competition at high stakes. 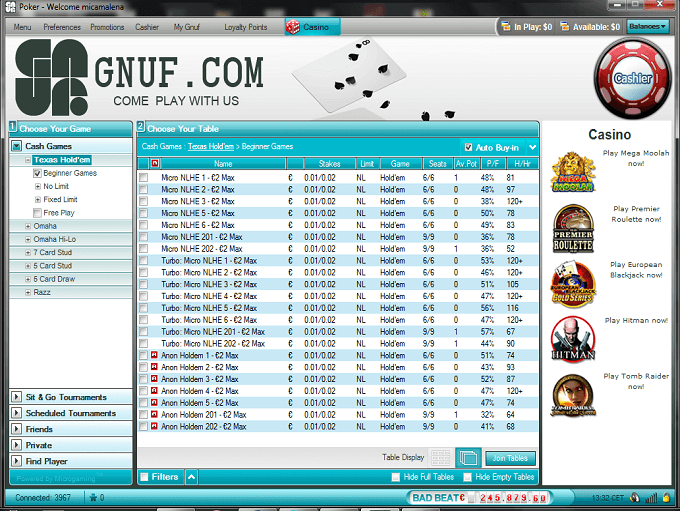 GNUF is connected to the Prima Poker network, which means that it is also using the same software package as the rest of that network. Developed by Microgaming, this package features most of the options a poker player can think of. Player notes are there, mini sized tables as well, but most importantly, you have a lobby with great filtering functionality. Unfortunately, GNUF falls short on graphics. There is virtually no poker feeling to it, but vanity is far from everything that completes online poker anyway. Microgaming has been around since the dawn of poker, so the software is essentially free from bugs and other annoyances. Roughly 20,000 players are connected to GNUF during peak hours. This is a small number if compared to the real giants, but fact is that you will find plenty of competition even when looking for higher stakes. Occational $200/$400 in NL are played, but you will have to be lucky to find them. Anything lower does offer quite a few opponents, however. As expected, most of the traffic is in the Texas Hold’em, but Omaha is growing steadily. More than half of the traffic is in the ring games. A tournament player is usually very specific in what kind of tournaments he or she is looking for, but GNUF does offer a good diversity with World Series of Poker satellites, World Poker Tour satellites and guaranteed tournaments. These range from guaranteed pots at $1,200 and all the way up to $250,000. In other words, there is usually plenty of action. Aside from the guaranteed tournaments, you also have a plethora of “this and that”, simple tournaments that pop up without guaranteed prizes. Texas Hold’em and Omaha are the two standard games no poker room can live without. GNUF is no exception. In fact, you have three more games added to the box. 7 Card Stud and 5 Card Stud are the two most played of the remaining, followed by 5 Card Draw. The latter one features good traffic in the lower stakes but the higher you go, the less competition. The unexpected strength of GNUF is the remarkably soft competition. It is not the softest you can find, but not very far off either. 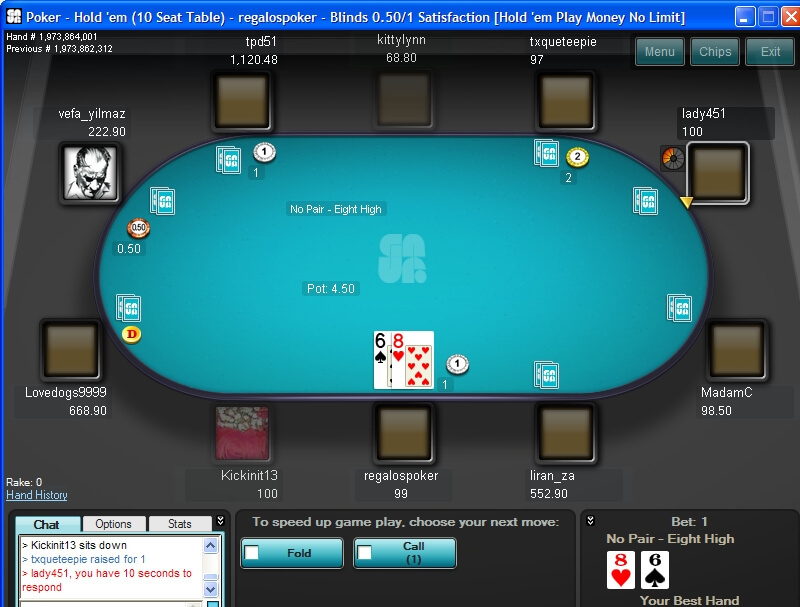 During our tests, we found $4/$8 games with 50-55% average players per flops. Typically, this number is much closer to 30%. The vanilla bonus of GNUF is a 100% match with only $50. As a visitor at EveryPoker.com, you get a 10 times larger bonus, namely the 100% up to $1000 super bonus. It is fairly easy to claim, but we recommend you to play at least $1/$2. In more technical terms, you must clear 7 GNUF points for every $1 of bonus cash you get. To claim it, you must enter bonus code top500 at signup and any other time you are asked for the GNUF promo code. More information is available on our GNUF promo code page. No loyalty promotions are currently offered at GNUF. Most players don’t acknowledge this as an essential part of a poker room and neither do we, but it is nice to feel that reward coming every now and then after a lot of trustworthy poker play. Many of the promotions offered here are of the smaller kind, such as the Magic Hand, which is basically a hand declared as the magic hand, earning you $2,500. Extreme Stack is another, which grants players $2,000 to play with. Bad Beat Jackpots are offered too and usually come in the area of tens of thousands of dollars. GNUF is also putting some action to World Series of Poker and World Poker Tour with exciting poker tournaments. If live events is not your beef, then look for the guaranteed tournaments that go from a tiny $1,200 to the massive $250,000 guaranteed NL. GNUF offers telephone support with many toll free numbers from around the world. The response time is usually fast. For less urgent issues, they recommend you to drop a mail to the e-mail support. Additionally, a skinny FAQ is provided.